12:30 am --According to Michael, as stated above, this is roughly the time he returned home after climbing the tree next to the Moxley residence. 1:15 am to 1:30 am--According to Julie, interviewed on 7/26/94, Mrs. Moxley called around this time to ask about Martha. "I went upstairs and asked Tommy where she was, when the last time he'd seen her. He said the back door, and then he had to study for a test. He was tired. So, I went back downstairs and told Mrs. Moxley the same thing." Julie added that Tommy was asleep, his room was dark, and that he didn't get out of bed." 3:15 am --According to Jackie Wettenhall, as interviewed on 10/9/93, Mrs. Moxley called asking to speak to her. Mrs. Moxley reached her mother, Mrs. Wettenhall-Keating--who confirmed this detail in her interview of 10/7/92. 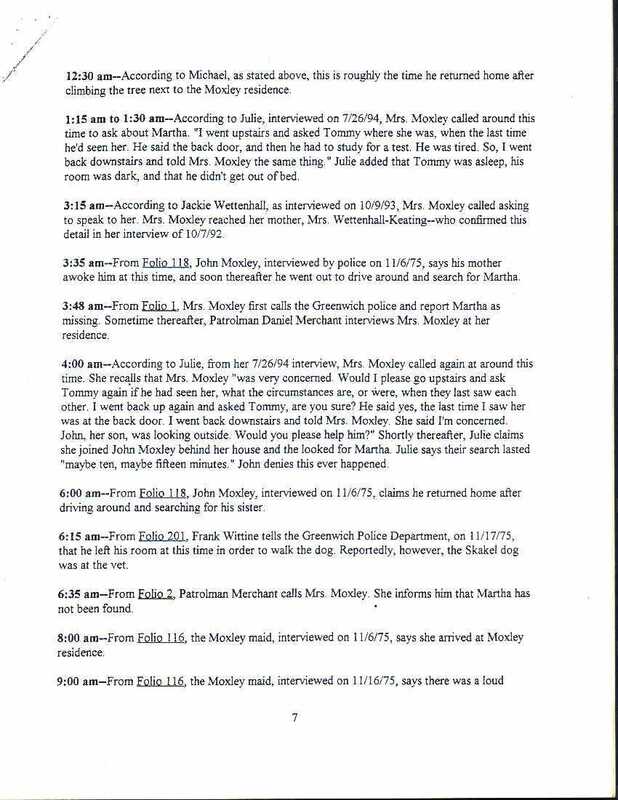 3:35 am --FROM FOLIO 118 , John Moxley, interviewed by police on 11/6/75, says his mother awoke him at this time, and soon thereafter he went out to drive around and search for Martha. 3:48 am --FROM FOLIO 1 , Mrs. Moxley first calls the Greenwich police and reports Martha as missing. Sometime thereafter, patrolman Daniel Merchant interviews Mrs. Moxley at her residence. 4:00 am --According to Julie, from her 7/26/94 interview, Mrs. Moxley called again at around this time. She recalls that Mrs. Moxley "was very concerned. Would I please go upstairs and ask Tommy again if he had seen her, what the circumstances are, or were, when they last saw each other. I went back up again and asked Tommy, are you sure? He said Yes, the last time I saw her was at the back door. I went back downstairs and told Mrs. Moxley. She said I'm concerned. John, her son, was looking outside. Would you please help him?" Shortly thereafter, Julie claims she joined John Moxley behind her house and they looked for Martha. Julie said their search lasted "maybe ten, maybe fifteen minutes." John denies this ever happened. 6:00 am --FROM FOLIO 118 , John Moxley, interviewed on 11/6/75, claims he returned home after driving around and searching for his sister. 6:15 am --FROM FOLIO 201 , Frank Wittine tells the Greenwich Police Department, on 11/17/75, that he left his room at this time in order to walk the dog. Reportedly, however, the Skakel dog was at the vet. 6:35 am --FROM FOLIO 2 , Patrolman Merchant calls Mrs. Moxley. She informs him that Martha has not been found. 8:00 am --FROM FOLIO 116 , the Moxley maid, interviewed on 11/6/75, says she arrived at the Moxley residence.